If you’re a triathlete, you’re now moving from winter off season towards racing season. Your fitness is probably coming around and you’re really starting to turn the screws in training. Nothing will derail your progress faster than an injury. If you want to have a successful racing season, staying injury-free should be a top priority. Here, I want to give you some tips and ideas to keep you off the injured reserve and training and racing strong. 1) Keep up the gym work: It’s an old school mentality that streng th work in the gym is only for the winter or “off season.” Most professional triathletes stay working in the gym year round now. Maintaining gym work as part of your training regime throughout your racing season will not only help your overall strength and muscle recruitment, but it will also help keep your stabilizing muscles strong, thus helping to prevent injury during your larger volume training. 2) Soft surface running: Elite runners know that the pavement is your enemy when it comes to injury prevention. You can help reduce your risk of stress fractures and other injuries from repetitive impacts by staying off of hard surfaces when you lace up your shoes. The more miles you can run on softer surfaces rather than concrete and asphalt the better. Dirt trails or roads are ideal for putting in the bigger miles, but there are other options to minimize your pavement time. Treadmills, grass soccer fields, and tracks are all other excellent options for running depending on the specific training session. If you’re faced with an area where pavement is your only option, always choose asphalt over concrete. Asphalt actually gives a little with each stride where concrete does not, so the asphalt road will provide better shock absorption than concrete, and thus less pounding. If you want to know how much “harder” concrete is than asphalt, one source I found had the measure for how much an object resists deforming (modulus of elasticity) for asphalt at 380 kpsi and concrete at 4500kpsi. The moral of this story is stick to the softer surfaces for your running miles to help prevent those repetitive stress injuries. 3) Maintain your body work: Body work is to training what flossing is to dentistry. We all know we should be doing it all of the time, but as soon as we get tired, it’s the first thing we drop. Then when you’re injured and go into a physical therapist, the first thing they ask is how much foam rolling and stretching you do. 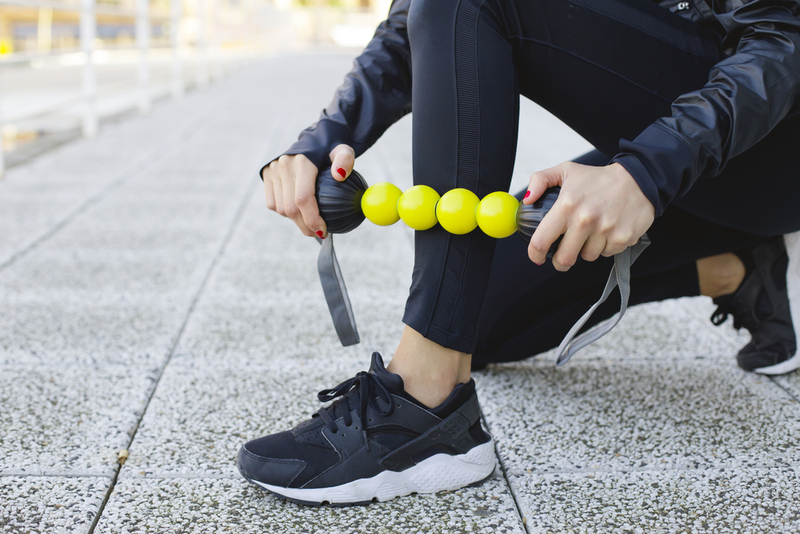 When you’re tired, the last thing you want to do is hop on the foam roll, but the reality is that keeping up with a body work regiment will help keep your body happy and healthy. Massages, stretching, and foam rolling are very effective at helping with injury prevention. 4) When in doubt, don’t – My uncle, who is a lifetime runner gave me some advice when I was a new runner. He said an old coach of his used to say that during a taper “when in doubt, don’t!” If you’re not sure if your should do something in training, you’re probably better off if you don’t do it. I like to extend that advice to injury prevention. I learned the hard way (time and time again), that if you feel tightness or a little pain coming on, stop the workout. It’s not worth risking a pull or strain just to soldier through a session and check the box on your training program. It’s better to bag that workout, take it easy for a day and come back to hammer through the rest of the training plan, than to be out for a couple weeks with a calf or hamstring pull. Trust me on this one, I was the worst offender of this during the first two thirds of my racing career. It took a lot of pulls and strains before I gained the wisdom to stop a workout as a precaution rather than let my motivation and ego keep me going during a workout. 5) Keep your warm-ups slow – Moving into your racing season, your fitness will naturally improve as you try to reach your peak. As you get fitter, you may feel urge to start out faster on your swim, bike and run workouts because your winter paces feel easier. Keep in mind that your body still needs a nice, long, and slow warm-up to get your muscles supple and malleable before you start hammering away. Always remember the common analogy that your muscles at the start of a workout are like a rubber band pulled out of the freezer. Stretch it too fast before it’s warmed up and it will snap. The same is true for your muscles. Keep your warm-ups nice and slow, even if the pace feels too easy. 6) You still need recovery blocks – You’re now counting down your final months and weeks to your key races. You’re fit, strong, and better yet, motivated. This is a great position to be in, but it can also be dangerous if you overreach. Some athletes want to build and build; add in more and more intensity. True, you need to add volume and/or intensity to create a training response, but if you don’t give yourself recovery blocks, or back off for a week here and there, you will increase your risk for burn out and injury. Remember, you never get stronger in a workout, only during the recovery! 7) Substitute a long bike for a long run – A great tip I learned from a former coach was to substitute an extra long ride for a long run periodically. We all get in the mentality of Saturday long ride, Sunday long run. It’s the triathlon way. While long runs are an essential piece to your training plan, they are also the single workout that most increases your injury risk. Now and then, my old coach would have a weekend where I didn’t have a long run. Instead, Saturday would be a medium-long to long ride (3-5 hours) with hard intensity. Then Sunday would be a long endurance ride of 5-6 hours. Just relaxed endurance pace riding. You still get a great cardiovascular boost from the double long ride but without the pounding of the long run. It’s also a great way to boost your cycling fitness. For the type-A triathletes who mentally can’t miss a long run, don’t worry, you won’t lose your run fitness by missing one long run. Of course you need to have a solid cycling base before you try this because you don’t want to end up with a cycling injury. 8) Stay on top of your hydration – As the weather warms up and your training load increases, you will be in a constant battle to stay hydrated. If you become chronically dehydrated, you increase your risk for several types of injuries; more specifically pulls and strains. Calf and lower leg pulls or strains can sometimes be attributed to chronic dehydration because the muscles are not as supple when they’re in a dehydrated state. Make hydration a priority throughout your season. It should be something you stay on top of before, during, and after all of your training. 9) Proper Fueling – A tired body and mind resulting from inadequate fueling can contribute to injury risk from fatigue due to mechanical failure or poor decision making from sub-optimal brain fueling. Athletes talk anecdotally about the dreaded bonk, but in reality, if you reach the point in a race or training where you’ve sufficiently depleted your stores to put you in that state, you’re putting yourself at risk of harming yourself. Help mitigate that risk by ensuring you keep your mind and body fueled using XRCEL’s extended release micro-gel technology as your fueling source throughout your training and racing. After reading this, you probably recognize that injury prevention is primarily about risk reduction. As you think through your training, racing, and recovery, try to get into the mindset to mitigate as many of the injury risks inherent to our sport as you can. Setting yourself up to have your best race is as much about getting you to the starting line healthy as it is getting you there fit! about getting you to the starting line healthy as it is getting you there fit! “Asphalt actually gives a little with each stride………”. I’m throwing the B.S. flag on this one. You have GOT to be kidding me. And giving a psuedo reference for deformation of asphalt vs concrete under the circumstances of running is ridiculous.